Home » Blog » Untamed Crowned Eagle – The Newest Slot In The Untamed Range! The brand new eagle-ly awaited slots game from has finally been announced. 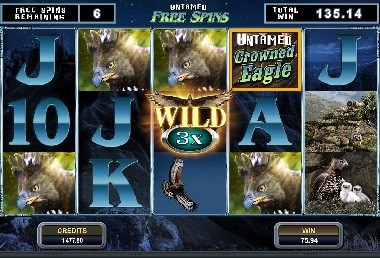 Untamed Crowned Eagle promises to be the best video slots game yet. Inveterate online casino gamers will be in for the flight of their lives with this exciting twist on the classic 5-reel slot. 243 ways to win! Nothing is more exciting than the high probability of “beating the house,” and this game provides the perfect opportunity to do that. Revolutionary game-changing patented features give players a clear edge as they Lucky Nudge ™ their way to Free Spins by increasing the odds in their favor. Another odds-changing feature is Your Gamble ™, which allows players to tweak their odds and bet up to 20 times their wager. Talk about leverage! And who will be able to resist the Collect-A-Wild ™ feature that lets players collect Wild tokens every time a Wild symbol appears – collect 4 and see a reel go completely Wild for 4 spins! And let’s not even think about forgetting the Soaring Wild ™ feature that engages during free spins and randomly turns other symbols into Wild Symbols – with a variable multiplier that could get you up to 10x coins. Scatter, Wild and Trigger your way to victory over the skies in this ‘flight to the finish’; get 10 spins and a 1x multiplier during the Free Spins bonus and go home with coins falling out of your pockets and a great big eagle smile on your face. Disclaimer: Untamed Crowned Eagle is not for the faint of heart. If you think slots are boring because the player never wins, you’re in for the sky-ride of your life. This game will keep you on your toes as you fight for aerial supremacy with exciting, enticing and entertaining bonus features that thrill you time after time. The Eagle is Landing on March 5; Get Ready to Rumble. This entry was tagged untamed crowned eagle. Bookmark the permalink.